PublisherPick is a platform where publishers, bloggers and content creators can monetize their website, gain high eCPM and traffic engagement. Publishers have the benefit of relying on the expertise of a company that has been in the industry for over 20 years. 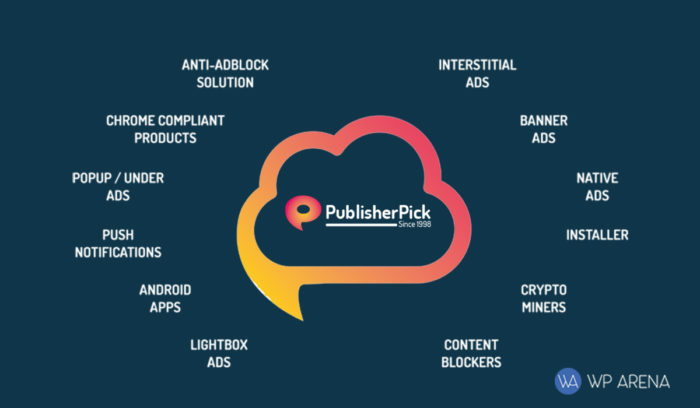 The PublisherPick team provides many indistinct features like anti-adblocker, servers problem solving, dedicated support managers and many types of ads. PublisherPick seems to offer the highest eCPM in the market. This is achieved through machine learning and optimization engines. The company works with publishers all over the planet and has over 1.5 Billion daily impressions. This makes it one of the few publishing networks that have the ability to support publishers on any scale. PublisherPick offers a variety of solutions that let you configure multiple parameters and caps for ads. It is extremely easy to use. Users can signup within minutes, once they request an invite and it gets accepted. The company is always looking to hire the best talent Israel has to offer and ensures that they are up to the mark when creating tools to help publishers monetize their content more efficiently. PublisherPick has created one of the first anti-adblockers on the market. The developers have also created algorithms that enable them to filter almost all malicious advertisers. This is extremely crucial since no one wants their viewers and traffic to become targets of some malware running in the background posing itself as an advertisement. Secondly since practically everyone on the Internet has installed ad blockers on their web browsers, many of the revenue that was to be generated by clicking on ads is lost. To counter this the company made one of the world’s first anti-adblocker software. This way publishers will have a better chance at earning their fair share of the revenue dependent on the traffic they get on their website. PublisherPick also focuses heavily on the optimization and user experience of the users’ website. The ad network implements machine learning in order to make websites highly optimized so that viewers do not have any issues such as bug, crashes or loading issues. This makes PublisherPick stand out from the rest of the pack. Other ad networks focus all their efforts on making monetization an easy and streamlined process but do not favor website optimization and functionality. As effective optimization leads to a good amount of traffic and to a good amount of revenue from the site. PublisherPack puts all its efforts into making the entire website a great experience for advertisers, publishers, and visitors. PublisherPick’s marketing cloud was developed so that publishers do not have to worry about the nitty-gritty details about their website and rather just put their energy into the content of their site. PublisherPick is an easy to use platform for all publishers. In the monetization sphere, PublisherPick offers pop up ads, push notification ads, banner ads, Interstitial ads and many more. Since PublisherPick’s eCPM has the highest response rate in the advertising industry compared to standard ad networks, it offers great value to its clients. The ad network’s dedicated support agents are always willing and manage every little for their publishers. On review. I totally agree with this article. It is really helpful to people who want to submit reviews on their sites.